This museum contains a number of interesting and early medical and 'quack' medical electrotherapy instruments which I have acquired while searching for early telegraph instruments. 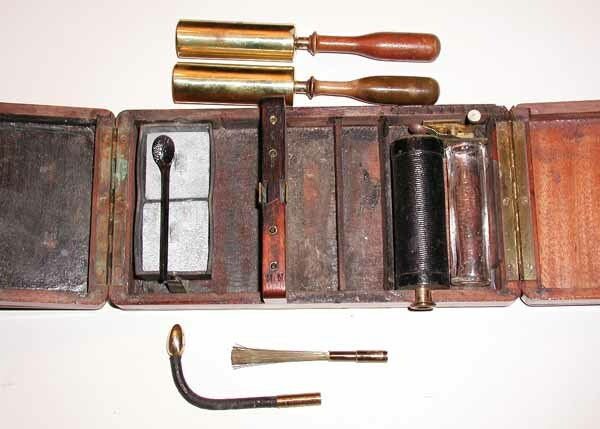 I am always interested in trading medical instruments for early and interesting telegraph instruments. The items in this museum which are still in my possession are available for such trades. Items which have been traded are also included in the museum for reference purposes. Many devices were developed to impress patients with their complexity and beauty which helped convince them that they could be 'cured' by the machine. Fast-talking 'doctors' would describe the efficiency of the machines and further try to convince the patients that they would soon be on the road to recovery. 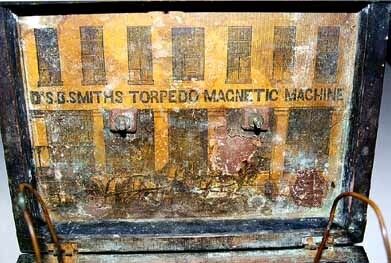 DR. S. B. SMITH'S TORPEDO MAGNETIC MACHINE:(16KB) This is a very early (1850) example of a so-called "quack" electrotherapy machine. Almost as soon as it was discovered that the low voltages produced by a battery could be stepped up to a high enough voltage to give "tingling" electric shocks, early "Doctors" sold these "treatments" to patients as cures for a wide variety of ills. 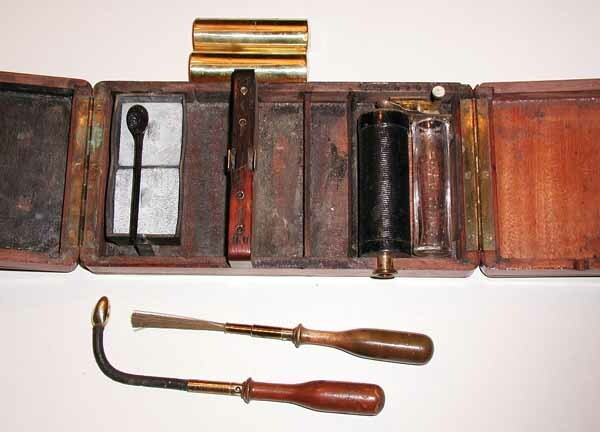 These "quacks" claimed that the treatments would cure just about any malady and the early devices were made to look as impressive as possible to try to convince the patient that they were complex and effective. electric motor seen in this photograph:(29KB). 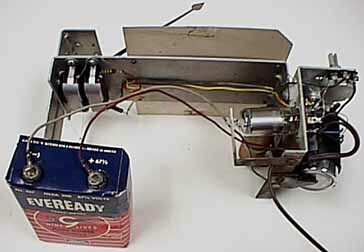 The spinning electric motor interrupted the voltage going into the horizontal coil which acted as a step-up transformer to increase the battery voltage to a voltage high enough to give electric shocks. 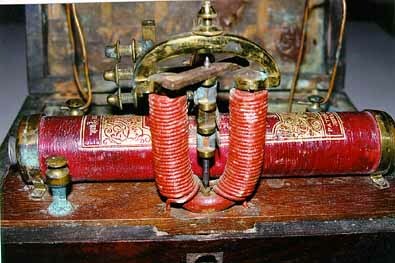 The intensity of the electric shocks was regulated by sliding a metal bar into the center of the coil. The farther the bar was slid into the coil, the greater the magnetic induction and therefore the greater the voltage. 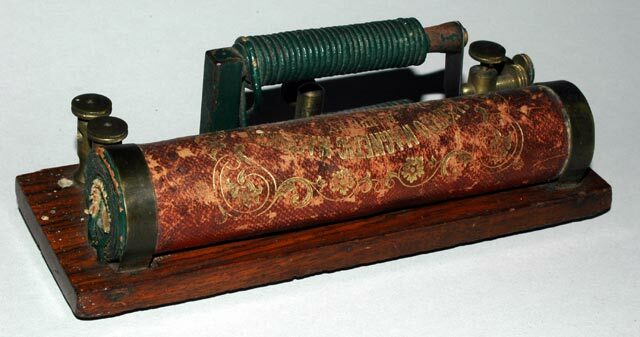 W.C. & J. NEFF ELECTRO MAGNETIC MACHINE PROBABLY MADE BY PIKE:(32KB)This is a very early (pre-1850) example of a so-called "quack" electrotherapy machine. 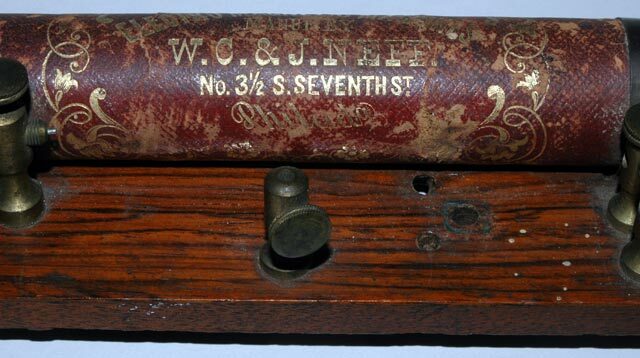 Dr. Currier's book (mentioned above) shows a machine that is identical to this machine in its wooden box and carrying the label of Benjamin Pike Jr. of New York. The box is missing from this machine but the gold lettering on the leather cover of the coil reads: ELECTRO MAGNETIC MACHINES, MANUF. BY W.C. & J. NEFF, No. 3 1/2 S. Seventh St. Philada. It is possible that NEFF may have manufactured these machines under some kind of license from Pike or to fill specialized orders for Pike. A close inspection of the hardware shows that the metal parts of the machine were mostly or completely hand made. 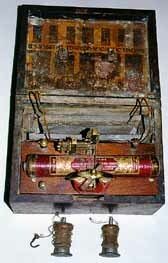 VERY EARLY A. GAIFFE (PARIS) QUACK ELECTROTHERAPY MACHINE:(18KB) This is a late 19th Century Electrotherapy machine designed to give high-voltage electric shocks to 'cure' a wide variety of maladies. 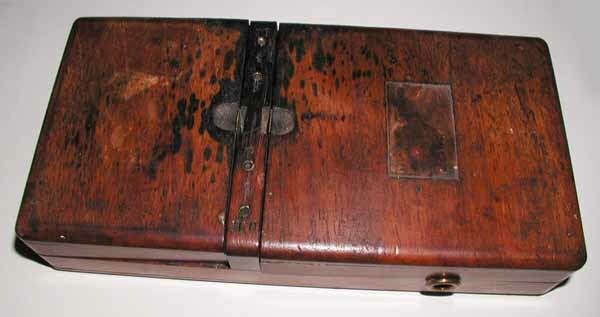 The entire device is housed in a small folding wooden case. 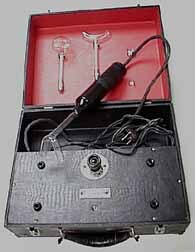 The set consists of an early chemical battery, a buzzer-interrupter designed to change the DC from the battery into high voltage pulses capable of giving a tingling electric shock to the 'patient', and several electrodes used to apply the shocks to different parts of the body. The very unusual battery consists of two squares of zinc and a hard rubber container used to hold the electrolyte solution. A tiny spoon is included to facilitate stirring the electrolyte. The buzzer-interrupter consists of a coil of wire wound around a metal core into-which can be inserted a metal rod to vary the strength of the shocks. The normally-closed contacts of the buzzer are connected to an ivory-handled on-off switch. The supplied electrodes consist of a brass brush, a curved, pointed, internal electrode, and two brass cylinders. Any of these electrodes can be screwed onto insulated handles to prevent the 'doctor' from receiving any shocks. 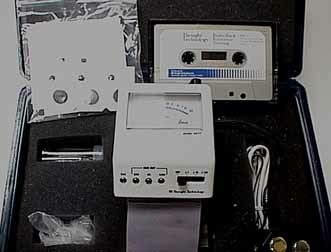 THE ''ELECTREAT'' PAIN RELIEF MACHINE:(15KB) This is another device designed to give moderate electric shocks and claiming to treat pain. A single 1.5-volt battery fits inside the handle and the intensity of the shock is adjusted by the sliding control on the side of the handle. 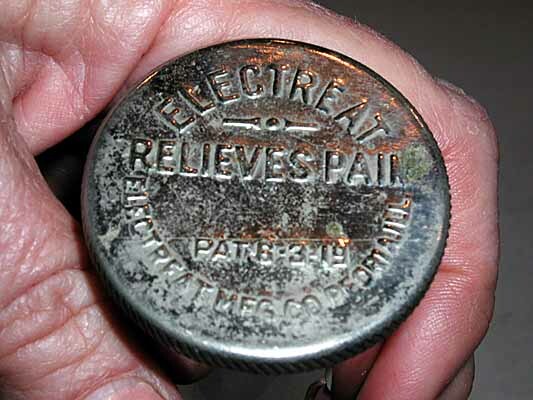 The label on the bottom of the handle reads: ''ELECTREAT, RELIEVES PAIN, ELECTREAT MFG CO, PEORIA, ILL. Pat: 6-3-19. THE 'VIOLET RAY' CURE-ALL DEVICES:(14KB) Tens of thousands of these kinds of Violet ray devices were sold and used by quack doctors to 'cure' an extraordinarily wide range of disorders. Reading from the instruction book that accompanied this example of the machine, it claims to provide Health, Power, and Beauty, and to cure: Problems with circulation of the blood, the heart's action, bumps of the funny-bone, germ infections, weakness, the waste of the body, congestion, impaired physical development, pains and aches, complexion and skin diseases, facial and body blemishes, hair loss, headaches, inflammation of joints, muscles, nerves, Atrophy, circulatory disorders, constipation, deafness, goitre, high blood pressure, arteriosclerosis, insomnia (sleeplessness-Brain Fag), indigestion, dyspepsia, neuritis, nervousness, hysteria, melancholia, neurasthenia, neuralgia, obesity, pain, paralysis, prostate gland problems, scalp diseases, falling hair, dandruff, asthma, anemia, bronchitis, catarrh, hay fever, rose fever, colds and other inflammations of the upper air passages, and, of course, cancer. 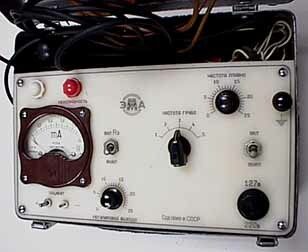 The violet ray devices produced a very high voltage by stepping up the voltage from a wall-socket through the use of a step-up transformer. 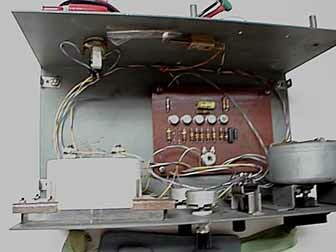 The low voltage in the primary coil induced a voltage into a many-turn secondary coil which stepped-up the voltage. 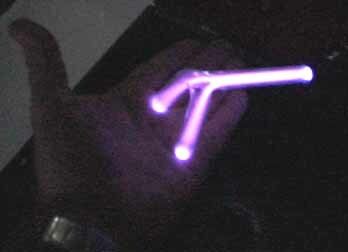 This high voltage was impressed on the end of a glass tube filled with a gas which lighted up with a violet color when the voltage was applied. The lighted tube looked very impressive to a patient and became even more impressive as the 'doctor' described how it was 'curing' the patient. Although this example is only supplied with three tubes, most violet ray machines were supplied with many different shapes of glass tubes to facilitate treatment of hard-to-reach parts of the human body. In recent years, considerable concern has been voiced regarding the possibly dangerous effects of Electromagnetic Fields (EMF) such as those produced by power lines, radio transmitters, and cellular telephones. The Clarus anti-emf device claims to use ACD (Accumulated Capacitance Dispersion) Technology (tm) specifically developed for residential and commercial environments to reduce or eliminate the presence of possibly dangerous electromagnetic fields. Other versions of Clarus ACD technology are also available for computer, video, vehicle, commercial, and industrial applications. It carries a label which reads: "The Clarus system has been developed for experimental purposes only. It does not directly or indirectly diagnose, prescribe, or treat any health problems. Persons using it do so for experimental purposes only." 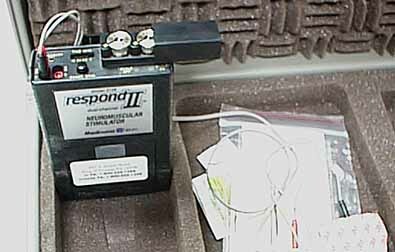 Opening the case reveals that it is a commercially produced digital table clock and a coil of wire hooked to an oscilloscope shows that its internal transformer and other parts radiate a 60Hz emf field of it's own. Over the years a number of devices have been developed which impose some form of electric current on a patient to actually produce a change in the patient's state. 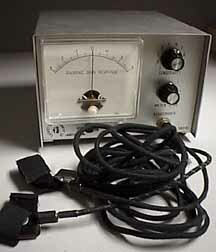 The Russians have been using electrotherapy devices for many years but relatively few such devices have been developed and used in America. 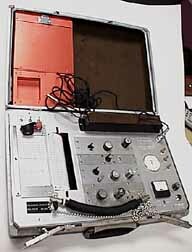 RUSSIAN ELECTROSONE OR SOMNIATRON ELECTROSLEEP MACHINE:(17KB)This is serial number 11 of the Russian Electrosone electrosleep machine. 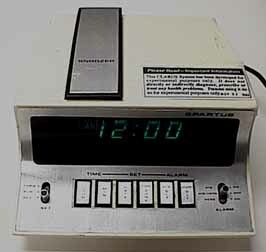 It was manufactured in 1962 and it uses square wave pulses of variable repetition rate and amplitude to induce and maintain a state of sleep. The pulses are produced by a circuit which uses a number of tubes. 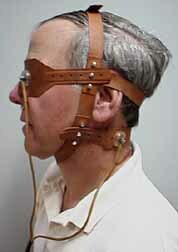 A special harness holds a pair of electrodes over the patient's two eyes and on both sides of the back of the neck so that the current passes on a plane through the reticular formation of the brain. Our research has shown that 15 minutes of stimulation not only puts a person to sleep but provides a "feeling" of having had a 2-hour 'cat-nap' while 2 hours of stimulation produce the "feeling" of having had an 8-hour sleep. The device is not sold in this country but is widely used in Russia especially in post-operative situations in which sleeping pills would normally have been prescribed. 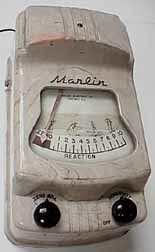 EARLY MARLIN TOY LIE DETECTOR CALIBRATED IN ANGELS AND DEVILS:(10KB)This early lie detector was sold by the Marlin toy company around 1950. It was equipped with sensitivity and balance controls. 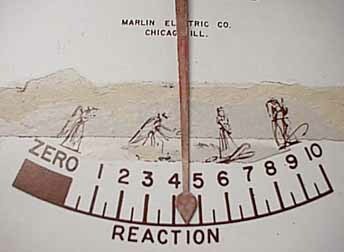 The meter was adjusted to zero and a movement to the right, up the meter scale indicated a 'lie'. The unit was very sensitive and provided quite reliable readings. 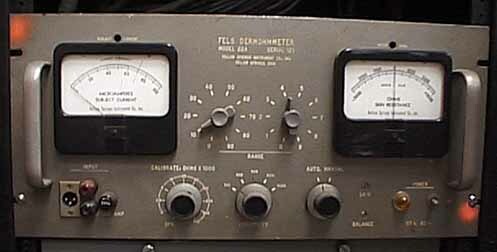 FELLS DERMOHMMETER LABORATORY GALVANIC SKIN RESPONSE METER:(17KB)This rack-mounted laboratory quality dermohmmeter was capable of tracking and correcting for slowly drifting changes in skin resistance by operating a mechanical stepping-relay which modified it's sensitivity as the skin resistance slowly changed. Thus it was capable of maintaining a constant overall sensitivity despite the slow drifts in skin resistance caused by the skin drying out under the electrodes. 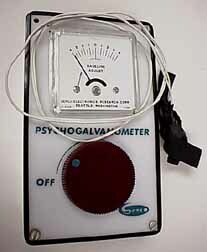 PSYCHOLOGY STUDENT LABORATORY PSYCHOGALVANOMETER:(13KB)This simple student-model psychogalvanometer measured changes in skin resistance using a 9 volt internal battery and a one-transistor dc amplifier. The large red knob allows the sensitivity to be adjusted to keep the meter deflections within the range of the scale calibrations. 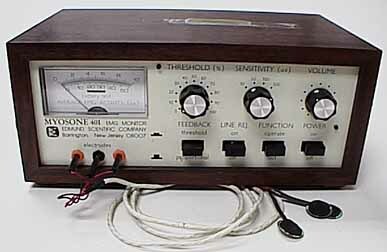 LAFAYETTE INSTRUMENT CORP STUDENT LABORATORY PSYCHOGALVANOMETER:(15KB) This sensitive instrument was offered for use in student psychology laboratories. 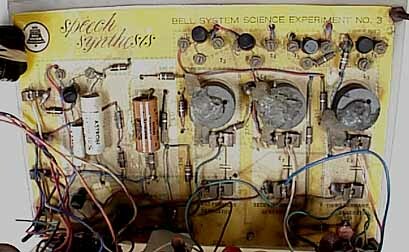 It used a sensitive integrated-circuit amplifier and was also often used for serious research experiments as well as instruction. It has adjustments to zero the meter and set the sensitivity. The meter zero adjustment allows it to be set to the absolute value of the skin resistance at the start of a session. The sensitivity control allows it to be adjusted to keep all of the subject's responses within the range of the meter calibrations. 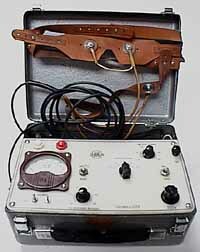 POLYGRAPH LIE DETECTOR:(16KB) This lie detector combined a skin resistance measuring circuit with a device which measured the breathing of the subject by using a pneumatic tube around the subject's chest. It also included an electrocardiograph to measure the subject's heart rate responses. This allowed multiple physiological measures of stress and thus a more reliable indication of lying. 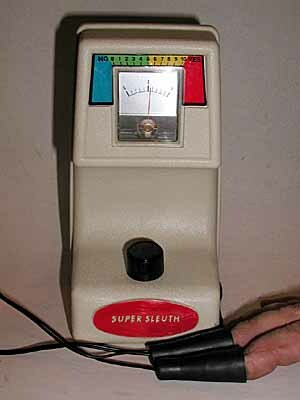 ''SUPER SLEUTH'' TOY LIE DETECTOR:(16KB) This is a nicely designed skin resistance measuring device housed in an attractive case. It is quite accurate but the brass electrodes interact with the skin salts to distort the readings somewhat. It operates on a single 9-volt battery. 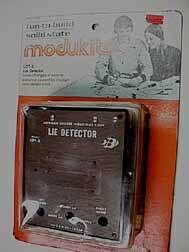 TOY RADIO SHACK KIT LIE DETECTOR:(21KB) This simple lie detector was sold in kit form by Radio Shack and the instructions made suggestions about how to use it as a lie detector. It contains a very sensitive and well-designed circuit with several discrete transistors and a 9 volt battery. To save money, it used an audio tone rather than a meter to indicate the subject's responses. 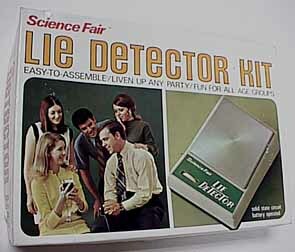 Although it was really a very high quality and reliable instrument, the instructions described how it could be used in party games to detect lying and I suspect that it may also have led to some VERY embarassing revelations because Radio Shack discontinued the design and came out with an electrically-identical unit (See next item) which was not called a lie detector but rather was called a biofeedback monitor. BIOFEEDBACK involves detecting, amplifying, and feeding back to a person's eyes or ears, the internal responses of the body. With this 'feedback' about what is happening inside their body, a person can quickly learn to control internal bodily responses and achieve control over their heart rate, blood pressure, and even stress levels. The following devices detect: stress levels by measuring perspiration on the skin, the electrocardiogram (EKG) and muscle tension by measuring the electromyogram (EMG) and allow a person to see or hear these responses. 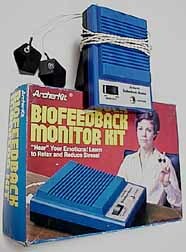 TOY RADIO SHACK KIT BIOFEEDBACK MONITOR:(18KB)This simple kit provides an auditory tone which varies as the subject's skin resistance varies. The skin resistance varies when the person perspires and perspiration accompanies stress. Thus, the tone can be used to provide biofeedback to help subjects learn deep relaxation techniques. It uses a very sensitive and well-designed circuit. 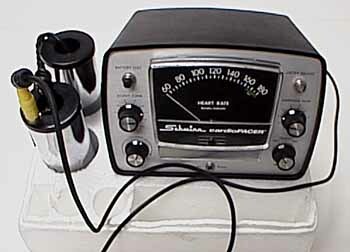 SCHWINN EKG RATE MONITOR:(20KB)This device provides a meter indication of heart rate using a pair of hand-held electrodes. The heart rate information may be used as biofeedback information to enhance attempts to learn to control heart rate and/or improve relaxation. 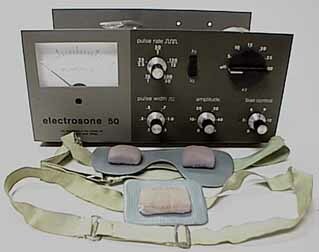 MYOSONE ELECTROMYOGRAPH:(0KB) This solid-state device made by Edmund Scientific Co. provides a meter indication of skeletal muscle activity. It is sensitive to even extremely slight levels of activity and can be used as an indication of muscle tension such as that which accompanies anxiety. It can therefore be used to provide biofeedback information to assist a subject in learning deep relaxation. The subject simply watches the meter while trying different relaxation strategies such as postural changes and relaxing thoughts. When the meter goes down, it gives the subject 'biofeedback' that the subject is being successful in relaxing more completely. THOUGHT TECHNOLOGY LTD. ELECTROMYOGRAPH:(17KB)This device provides a meter indication of even extremely low levels of muscle activity and can therefore be used to provide biofeedback showing how tense the skeletal muscles are. This information can be used to enhance a subject's ability to relax. An audio relaxation tape is included with the set to act as an additional aid to learning deep relaxation. MUSCLE AND NERVE STIMULATOR:(21KB)This device is used to stimulate muscles and nerves. Properly adjusted, it can provide relief from certain kinds of pain. 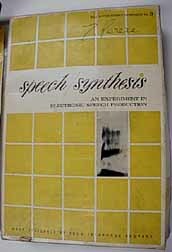 EARLY SPEECH SYNTHESIZER:(12KB) This early kit was offered by Bell Telephone Laboratories in the 1960's. It consisted of three tunable filters which shaped the adjustable frequency square wave pulses to form amazingly realistic reproductions of human speech sounds. FREQUENCY-MODULATED LOW FREQUENCY MULTI-CHANNEL TAPE RECORDER:(11KB)This 7 channel tape recorder employed pulse-width modulation to allow it to record signals with frequencies from 0 up to 1000 Hz. Thus, it could record many of the low frequency physiological signals from the nervous system which an amplitude-modulated tape recorder with it's typical 20-20,000 Hz frequency response could not record. A museum of antique scientific instruments. Please NOTE: It is w followed by the NUMERAL 1 tp Not: wLtp or wItp.